They believe, but they don’t understand. They fear, but they don’t appreciate. They serve, but they don’t love. That can be the only explanation. Saisha thought to herself, wiggling her toes in the pristine waters as a cool gentle breeze brushed her wet cheeks. What a shame to want to constrain the wild forces of nature into powerful, yet anthropomorphic incarnations. Why won’t humans accept that the universe is free? Why must a God have human attributes? Why do they need nature to conform to the human way of thinking? Just like mother, always wanting me to do what she believes is proper and right. Saisha remembered a T-shirt slogan she had once read. I was an atheist until I realized that I am God. She closed her eyes. The slogan wasn’t funny, she thought. Some humans no longer personified God, but humanity was still obsessed with controlling nature. Mother too is always trying to control my wild ways, she brooded. The human race was making great intellectual leaps, but all the while raging against nature. Can't they learn to work with nature, instead of against her. Nature isn’t the enemy, Saisha mused. She opened her eyes. Mother was on the shore holding a half eaten sandwich. “Saisha why do you put so much energy in to working against me?” Mother sighed. The words stung Saisha like shards of glass. “What do you mean, Ma?” She asked. Saisha gaped at mother speechless. Somehow mother had done it again, turned her own sophisticated metaphor against her. May be nature was schizophrenic with personalities ranging from a wild teen to a caring mother. She laughed. I’m doing it now, personifying nature, she thought. Perhaps it's a human disease and there is no escaping it. Author's note: As a mother of a little girl slowly but surely approaching her teens, I like to think about my own teenage years to help me prepare for this most difficult stretch of motherhood. Reflecting on those years has prompted many a story I have written, including a novel losely based on my own teenage experience with appendectomy. 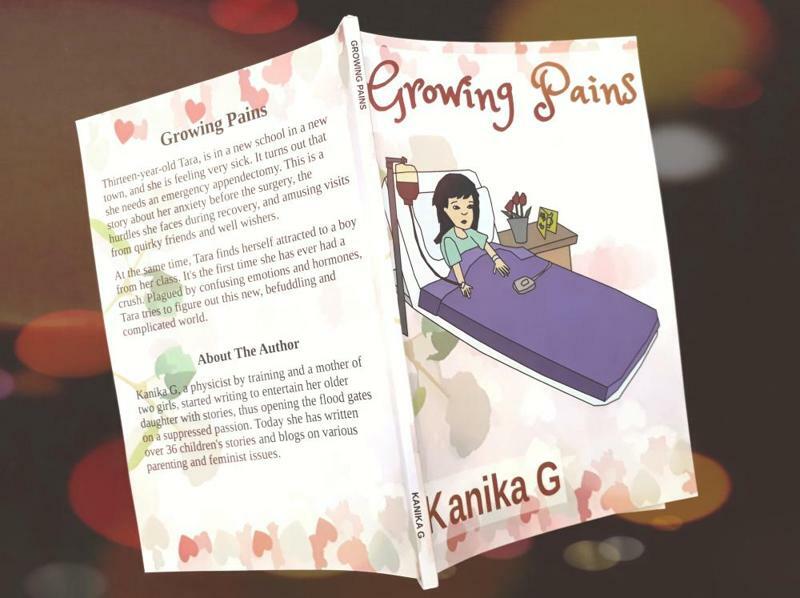 Thirteen-year-old Tara, the protagonist in my book Growing Pains, deals with the terror of surgery and the bliss of a first crush at the same time.